Pepper jelly can make a wonderful holiday gift from your kitchen. 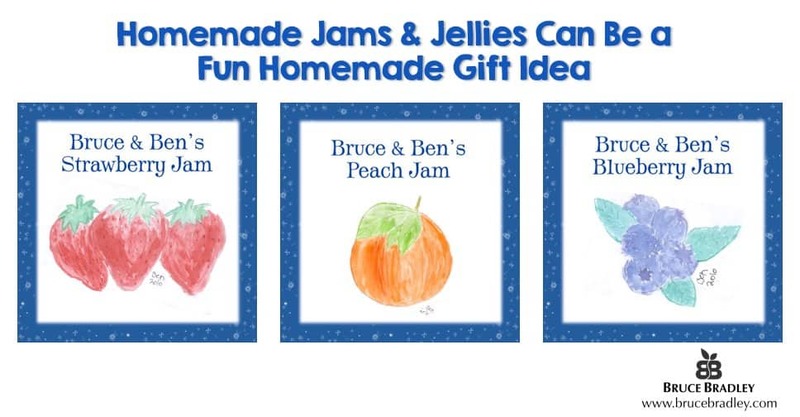 These wonderful jars of jelly make great gifts from your kitchen! Now don’t get me wrong—giving gifts is great. I’ve just always thought making something is a much better way to go. So for most of my adult life gifts from the kitchen have been our top choice. Over the years we’ve canned all different kinds of jams, jellies, chutney, and even marinated mushrooms. And during our real food journey the gifts from our kitchen have become a wee bit healthier, mostly by choosing higher quality, less processed ingredients. Probably one of the reasons I’ve enjoyed our gifts from the kitchen the most is how it’s involved my son, Ben, and increased his understanding of the importance of giving. From going out strawberry picking together to having him paint artwork for labels (here’s a sample from several years ago), and then delivering the gifts to our family and friends, homemade gifts from our kitchen have become a real, family tradition. Now you may be thinking, “Thanks for sharing your story, Bruce, but it’s December … and I can’t make anything right now.” And you’re right … it’s much harder this time of year, so I’ll be sure to share some jam recipes this coming summer! But here’s a recipe for one of our holiday favorites that’s quick, easy, and makes a festive gift … Red Pepper & Jalapeño Jelly. It’s filled peppers, apples, apricots, and you can customize the spiciness to your taste buds! Let’s not fool ourselves though—pepper jelly can have a ton of sugar in it. That said, my recipe has a 100% honey option so maybe it’s a tad bit healthier. And as my next post will prove, there are lots of ways to use pepper jelly that require just a little taste, so you’re really not using a whole lot of honey/sugar in any given serving. Ready to fire up a pot of pepper jelly? I promise, it takes me about an hour to make a batch of 10-12 little 4 ounce. gift jars—the perfect size to share as a party appetizer or to give as a gift. And if the timing isn’t right with the holidays, save this recipe for this summer. That’s when we do most of our holiday canning! Combine red peppers, jalapeños, apples, and apricots with 1 cup of cider vinegar. Pulse in food processor until chopped moderately fine. Pour pepper vinegar mixture into an 8-quart pot. Add an additional cup of cider vinegar and honey/sugar. Bring to a light boil and cook for about 15-20 minutes. When the jelly is almost cooked, add the lemon juice. There are three different ways to check when the jelly is done. My preferred method is to use a thermometer, but here's a link that explains each method. At sea level your thermometer should read 220F (see the prior link for temperature readings needed at different altitudes). Skim off any foam on the top and can the jelly. For canning the jelly, here's a link to a detailed guide. It really isn't that difficult, but look at my resources section for some suggested equipment that makes it easier! Cool and check lids for a good seal. Canned jams and jellies have a shelf life of 18-24 months. Please check the kitchen resources and tips section below for some of the equipment I use for canning. And enjoy this recipe … from our kitchen to yours for a special holiday season. Finally, stay tuned for tomorrow’s post when I share 7 ways to use pepper jelly in quick recipes. I’m even including a recipe card that you can share when you give it as a gift. 🙂 Enjoy! A great, water bath canner is an essential … especially for larger canning projects. If you’re just making one batch of the pepper jelly, a large pot or stockpot will work fine. If you’re planning on doing lots of canning, though, this Presto Pressure Canner and Cooker does a wonderful job and can be used as a boiling-water canner as well. A canning kit is a definite must if you’re going to try home canning. This one from Norpro is great and it’s BPA free! I use 4 oz. jelly jars from Kerr/Ball for canning most of my pepper jelly. They’re a perfect little size to share with some recipes! I’ve found these jars at Target (both online and in stores), and they’re also available at Amazon.